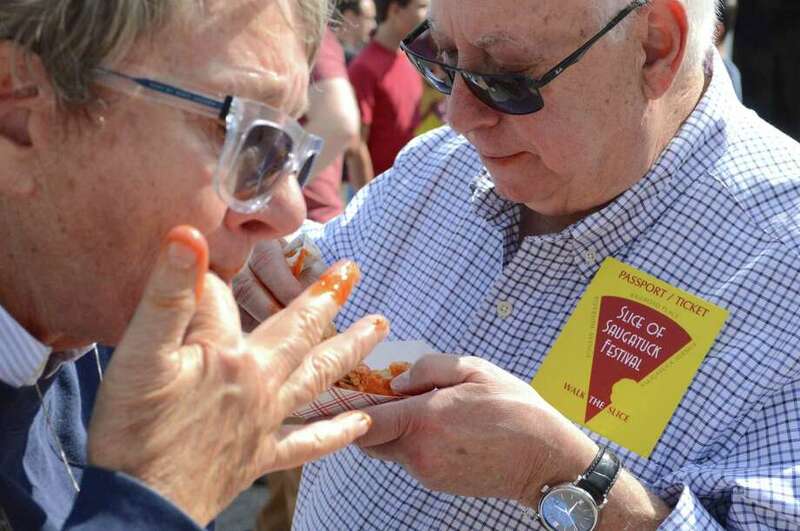 Bonnie Bohne and Andrew of Strauss of Saugatuck savor the sauce at the 6th annual Slice of Saugatuck Festival, Saturday, Sept. 9, 2017, in Westport, Conn.
WESTPORT — Hundreds of people came together Saturday afternoon to enjoy community, as well as contribute to it, at the Slice of Saugatuck Festival. For the sixth year in a row dozens of area restaurants put out samples of their best food for tasting by ticket holders, joined by live music and lots of smiling people strolling the area. Organized by the Westport-Weston Chamber of Commerce fundraiser, proceeds went to the Gillespie Food Pantry.